On Hanukkah, there is a tradition to place our Hanukkiyah in the window to remind the world of the miracle of Hanukkah – of the Maccabean triumph of religious freedom. As you place your Hanukkiyah in the window this Hanukkah, we invite you to bring to mind the millions of refugees in our world today still at risk because they have not yet triumphed over the forces that seek to oppress them for being who they are. Many have cast darkness on the plight of these most vulnerable people over the last few weeks. This Hanukkah, print and place this poster in your window and bring your support for the world’s refugees into the light, reminding the world of our responsibility to make sure that love and welcome win out over hatred and fear. This Hanukkah, share your light with those most in need. 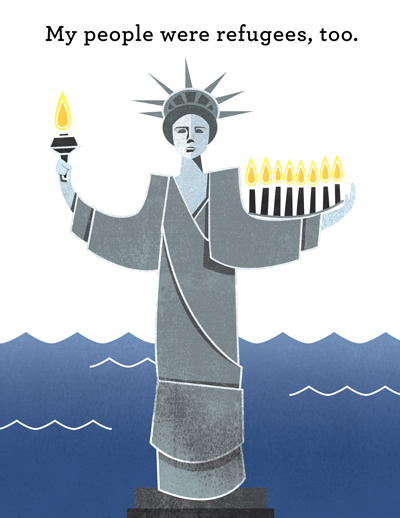 As you think about gifts that would mean the most to your family and friends, consider dedicating one night of Hanukkah to HIAS with a donation in their honor to support refugees across the globe. Download the Hanukkah blessings and a special reflection on Hanukkah to read as you light the Hanukkah candles (with a bonus question for thought and discussion! ).